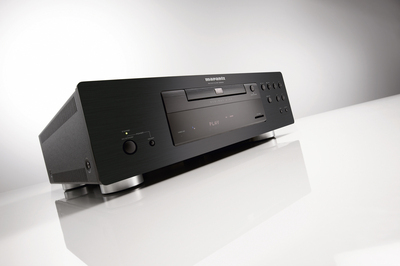 Marantz, makers of high-end audiovisual gear, has just brought out a flagship Blu-ray player for people with loads of cash or an obsessive interest in home cinema. The BD8002 has full 1080p and 24fps output, as well as onboard lossless decoding of most standard audio codecs. On top of that, there’s high-quality upscaling for DVDs, and will play all sorts of stuff: VCDs, SVCDs, MP3s, WMA and DivX video files, as well as displaying JPEG images. There’s an SD Card slot, too. The BD8002 is available now, and costs a lot of money. £1,800 to be precise. Pioneer is launching another Blu-Ray player, called the BDP-LX91. The company is referring to it as its ‘flagship’ player, and for good reason – it’s got a freshly-developed 16-bit video engine which will perform decoding, conversion, scaling and other adjustments at a rapid pace, as well as upscaling DVD content to 1080p. As well as lovely video, the player delivers crisp audio with 7.1 channel Dolby TrueHD and DTS-HD Master Audio decoding and bit stream output. There’s dual HDMI outputs, too, and it’s been certified as sounding really rather good by none other than legendary Beatles producer George Martin’s AIR studios. This player’s available now, but it’ll set you back £1,700. Ouch. Still, it’s a damn fine machine, and if you’re even considering it, then you won’t bat an eyelid at that price. Okay, I’ll have to admit I asked for this a bit. In my last post about Denon Blu-ray players I demanded to know what Denon would describe as ‘high-end’, after their ‘entry-level’ player cost £600. Well, this is it. 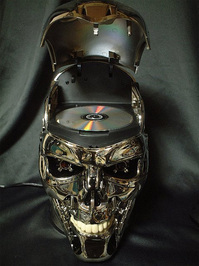 It’s the catchily-named DVD-A1UD, and it’ll play back Blu-ray discs, Super Audio CD (SACD), DVD-Audio, DVD-Video and plain old CDs. 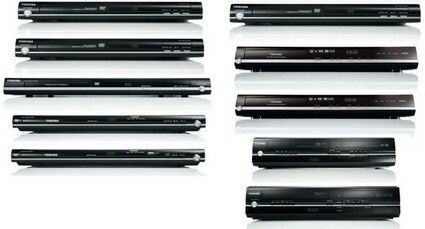 The DVD-A1UD is the replacement for the Denon’s previous universal DVD player – the DVD-A1XV. Full specs are over the jump. It costs a massive £3,300. I can safely say that I don’t know anyone who’d splash out £3,300 on a DVD player, but someone must, or they wouldn’t make the damn thing. It’s going to show up across Europe in March 2009, in either a silver or black finish. Who knows, perhaps by then you’ll be rolling around in pots of money. Denon can only hope. Onkyo has announced two new bits of kit for the home cinema buff on a bit of a budget. The HT-S5105 is a complete 5.1-channel home cinema system offering 5 x 130W output plus a 90W subwoofer, and much of the technology found on more expensive Onkyo products, but for just £350. Portable round DVD player and Simon separated at birth? 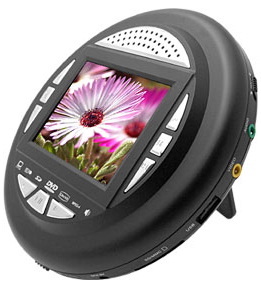 This black portable round DVD player is reminiscent of that childhood classic electronic memory game, Simon, but in fact it has a 3.5-inch TFT screen, DVD and MP3 playback, SD card reader, and video and audio outputs for connecting up to other equipment. Toshiba has announced ten new DVD models, including five standalone DVD players, three DVD recorders (two with hard drives), and even two with VCRs built-in, for those of you still attached to tape. 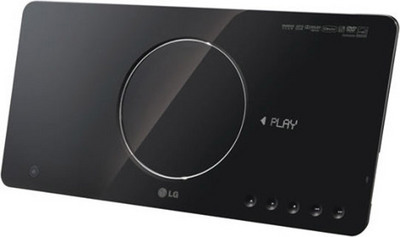 Three standard DVD players — the SD-180E, SD-185E, and SD-280E — offer usual functionality you’d expect, including JPEG viewing, DivX playback, and MP3 support. Taking a step up, the SD-480E and SD-580E offer upscaling of standard DVDs to 1080p high definition, feature HDMI outputs to connect to a suitable TV, and have Toshiba’s REGZA-Link which synchronises compatible equipment using a single remote control unit. Denon has launched upgraded entry-level DVD players, offering more eco-friendly, upscaling, sleekly designed goodness. The DVD-1740 offers “Near Full HD” upscaling of DVDs via an HDMI connection, progressive scan via component inputs, a clear front display, larger control buttons, and smooth, curved edges matching Denon’s 2008 Home Cinema receivers. There’s also DivX ULTRA functionality. Priced at £149.99. Philips has announced six new high-performance portable DVD players, two of which include an iPod dock which allows for the playback of video, audio and photos from an attached iPod. First up are the widescreen DVD players, available in 7, 8.5, and 10.2 inch screen sizes. They all feature a full in-car mounting kit, internal power supply unit, two headphone jacks, USB connection, AV in and out, and digital audio output.